"Extreme feminine beauty is always disturbing, madam." 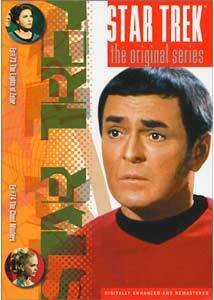 To see all Star Trek: The Original Series reviews, click here. This episode is one of the worst of The Original Series and particularly is an example of the worsening quality of the show in its third season. On the surface it seems to have interest, as it was co-written by Star Trek fan Shari Lewis, of Lambchop fame, and her husband Jeremy Tarcher. However, the story is a rehash of many of the "enterprise encounters a strange force" episodes and contains nothing to distinguish it from any other of that type. The only quasi-unique aspect is the story line of Commander Scott's love for the young woman who gets "possessed" by the alien entity. But, this seems to be lifted from the episode that features Apollo, Who Mourns for Adonais, where Scott also was very protective of a woman menaced by an alien entity. The object of Scotty's desire is Lt. Mira Romaine (Jan Shutan) on her first deep space mission to assist with the work on the library on the planet, Memory Alpha. This library is an impressive conceptualization, designed to contain all the knowledge of the Federation and available to all members for research. On the way to the library planet, the Enterprise encounters a strange cloud that emits a force that affects each member of the crew. Lt. Romaine is strongly affected by the experience, collapses on the bridge and is heard to be speaking in a strange language. She begins to have flashes of prescience and other symptoms of space-sickness that is put down her inexperience with deep space missions. It is particularly odd to see Scotty neglecting his duties to fawn over the girl. The booklet on the DVD notes that Shari Lewis had hoped to play the Mira character. That might have added some interest past the very dull performance of Shutan, who is the only one who could have saved this dull episode and fails. The worst thing about this one is that nothing happens really. Other than the lovesick Scott, the other main characters of the crew have nothing to distinguish their performance. One gets the feeling that the idea for this story was not strong to begin with, but was kept in the mix because of the celebrity authors. Being an obviously inexpensive episode to produce, with only one scene taking place off of the Enterprise probably also helped. The conclusion is pretty absurd and this is not a surprise. This one is for Scotty completists only and gets one paltry Enterprise. This is an interesting episode with its story of class conflict on the Federation member planet, Ardana. The unique conception of the settings and the direct conflict between the characters combine with the allegorical aspects of the plot line to make for an exciting an unusual tale. The original story was written by Oliver Crawford and David Gerrold (Trouble with Tribbles) and the teleplay was written by Margaret Armen. Stratos is a beautiful utopian city that floats in the sky above the planet with "sustained anti-gravity elevation." The inhabitants of Stratos enjoy a life of luxury and pursue the arts. On the planet below, the Troglytes, who mine the rare and valuable mineral Zenite, are reduced to a live of servitude and squalor. In typical bigoted fashion, the "elevated" Stratos-dwellers, with their philosophies and sophistication, are unable to perceive this slavery as wrong. Kirk in his usual straightforward fashion has a mission to perform and, despite his disagreement with the policies of Stratos, is only interested in obtaining a shipment of the Zenite, the only substance that can relieve a biological disaster on planet Marak II. Kirk is constrained from involving himself in the planetary affairs—unless it interferes with the completion of his mission. Immediate problems arise when the promised shipment of the mineral is held hostage by the Disrupters, Troglytes fighting to obtain equal rights. One of the subplots of this episode features Spock in one of his rare romantic interludes in which he is not affected by some strange alien force or other outside influence. After being attacked on the planet by the Troglytes, Spock and Kirk meet the High Advisor of the Planet Council, Plasus (Jeff Corey) and his daughter Droxine (Diana Ewing). Plasus introduces her as "one of our most incomparable works of art." Upon being introduced to Spock, Droxine notes, "I have never before met a Vulcan, sir." Spock dryly replies, "Nor I a work of art, madam." This episode includes an extended montage sequence narrated by the thoughts of Spock that is quite unusual and serves to add depth to a plot that fights the restraints of the hour-long format. This is followed by an encounter between Spock and Droxine that leads to that slow-talking that marks Spock's wooing. As they conversation progresses, the looks become imminently meaningful and they talk slower and slower. Meanwhile, Kirk has his own encounter with Vanna, the leader of the Disrupters, when she attempts to take him hostage while he is napping and he is forced to pull her into a clinch. Plasus promises to search for and obtain the Zenite consigment from the Troglytes, but his methods are not very palatable to Kirk. Jeff Corey was an odd choice to play the high advisor, being a more rough-hewn sort of fellow. One would imagine that the High Advisor of such an effete culture would be a much smoother character. Corey has had a long career, playing mostly heavies, in movie and television, with appearances that range over 60 years. He appeared in The Devil and Daniel Webster in 1941 and on the television Supermanin 1952, among a résumé that includes most of the popular shows in television history and many A- and B-movies. Still active, Corey made an appearance in 2000 on the television show The District. Ultimately, Kirk is forced to take a hand in the problems of the planet when time runs out on the search for the Zenite. His solution to the twin difficulties is interesting to say the least. although on close analaysis (as is true so many times) it does not quite hold up logically, the verve of the story and acting carry the show. This episode has all the elements that make for a good classic Trek show. The setting is unique, interesting traits emerge in the regular characters, the guest characters are interesting and the story is potent and intriguing. Plus, this gets serious bonus points for the costumes worn by Vanna and Droxine. This one is a keeper and gets three Enterprises. Image Transfer Review: Both episodes here are nicely tranferred and demonstrate the consistence that the series has shown over its release. The Cloud Minders is particularly good, with excellent skintones and a colorful setting that benefits from the nice balance and crisp detail. The Lights of Zetar has some weak special effects that are central to its story and can't overcome them. Audio Transfer Review: It is enjoyable to listen in Dolby Digital 5.1 to the subtle sound design on these old shows. The Cloud Minders has a very good musical soundtrack. The beeps, boops, shimmers and boings all come through nicely as well. Extras Review: What these discs gain in the image and sound transfer, they lack in extras. We get the usual slender information booklet and the original trailers. And... well, there isn't any more. Often, in the release method chosen by Paramount Studios of putting two episodes on each disc in a chronological order of sorts, we get a disc that has two episodes of decidely different quality. Here we have one episode that is a terribly weak story that represents all the worst of Star Trek: The Original Series and the other a fascinating story that demonstrates all the elements that make for the enduring interest in these old shows. The Cloud Minders is the essential episode on this disc and The Lights of Zetar is along for the ride.